MILLION DOLLAR PASSWORD: New Season! I had to hold off on any reviews of the new “Million Dollar Password” before now due to a strict confidentiality agreement I signed from the show. 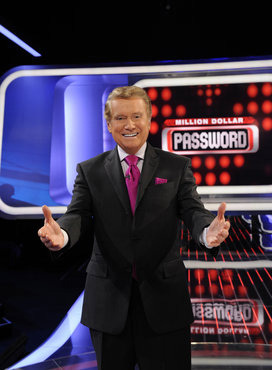 “Million Dollar Password” returned for a second season. This remake of the original show from the 1970s pairs two celebrities with two contestants. The celebrities help the contestants to climb their way to the final round where they can win a possible one million dollars! The show filmed two episodes per day. On one particular day that HOLLYWOOD JUNKET attended, was made very entertaining by celebrity guest William Shatner (“Boston Legal”), whom, I must add, made his grand entrance onto the game show stage in such a way that rivaled show host, Regis Philbin. Philbin pointed this out, and stated that Shatner acted as if he were the host of the show. Shatner played against Aisha Tyler (“Ghost Wisperer”) and her contestant partner. The game is generally fast-paced, and host, Regis Philbin is such an amazing pro he can deliver his lines with such strong credibility and generally in one take. However, his good friend, Mr. Shatner made quite the ruckess with show high jinks and upheld what is a typical two hour taping to a four hour one (no joke!). During a point in the game where the contestants have to switch partners, Shatner crossed Philbin and tripped on his podium in a very Charlie Chaplin manner. Twice, the show was stopped while executive producer (“Vinny”) came out onto the stage to clear-up any rules and regulations that may have been broken during the process of the game. Of course, Shatner was jokingly to blame by Philbin. Truth be told, as charismatic as Shatner was, he may not be asked back onto the show, simply for the fact that he is a bit “Million Dollar Password” challenged. Contestants are given a second chance at going for the final round. You’ll have to watch the show to see how Shatner’s game partner, an undefeated “Super Password Champ” from 1987, does. This episode airs Sunday, December 21st on CBS. Chelsea Handler (“Chelsea Lately”) and Jeff Garlin (“Curb Your Ethusiasm”) were also celebrity players on another upcoming episode that I attended. (air date: Sunday, February 1st).